I’ve been obsessed with making little pizzas ever since my visit with Jen. Follow Your Heart shreds are my favorite with Daiya coming in a close second. 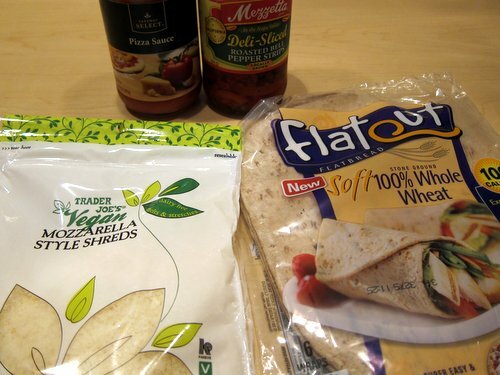 On a recent run to Trader Joe’s, I decided to pick up some of their branded Vegan Mozzarella Style Shreds. 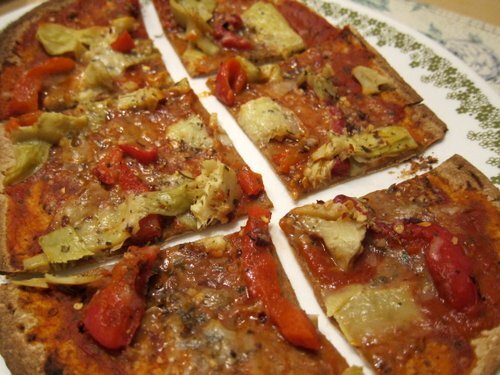 It gives me no pleasure to say that I thought the Trader Joe’s vegan cheese was, well, yucky. The shreds have gotten favorable reviews. The positives are that the cheese melts well and is inexpensive compared to Daiya. It also has a lot more calcium in it. More than one review called it the opposite of Daiya, and that’s something that I totally agree with. The shreds are dry and thin. Upon opening the bag, I took a good whiff and it smelled like cheese. Unlike Daiya and Follow Your Heart, which retain their shape and color, the TJ shreds seemed to ooze into the rest of the ingredients. It definitely melts like real cheese. 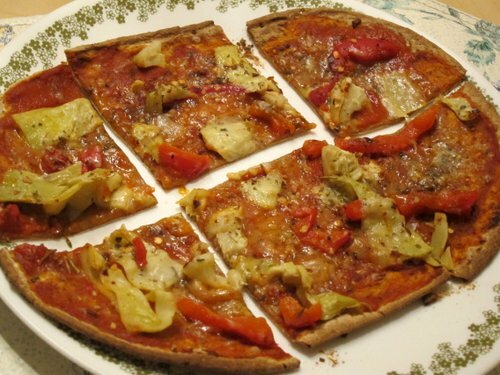 All my pizzas have these base ingredients: Flatout flatbread for the crust (this stuff is so great AND vegan), roasted red pepper, and pizza sauce (I really like the Safeway brand pizza sauce… and I am extremely sad that we will be losing our Dominick’s/Safeway stores in Chicago next month). 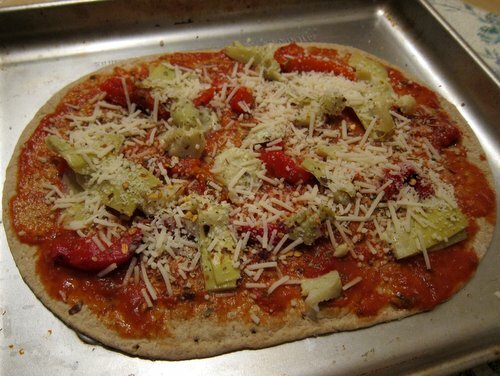 I constructed the ‘za and baked it. I was definitely weirded out by the discoloration of the cheese and also some of the ooze factor. The first bite tasted had a really sharp taste. There’s definitely something in the cheese to give it this effect. Then, I felt like the cheese was sticking to my teeth and it felt very powdery in my mouth. I sometimes feel like Daiya has this sort of synthetic stickyness to it that I find annoying. This was worse. I grew up eating processed meats. I would happily eat hot dogs or bologna for breakfast, lunch, and dinner. Gross, I know, but my Mom was a food chemist at a meat company and bringing home the product was a benefit of the job. She also analyzed vegan hot dogs and sausages, but would never bring that weird stuff home. She recently mentioned how annoying it was to test vegan “meats” because there was no cholesterol. I could sort of explain why, but she’s the chemist and my layperson translation doesn’t quite make sense to even me right now. 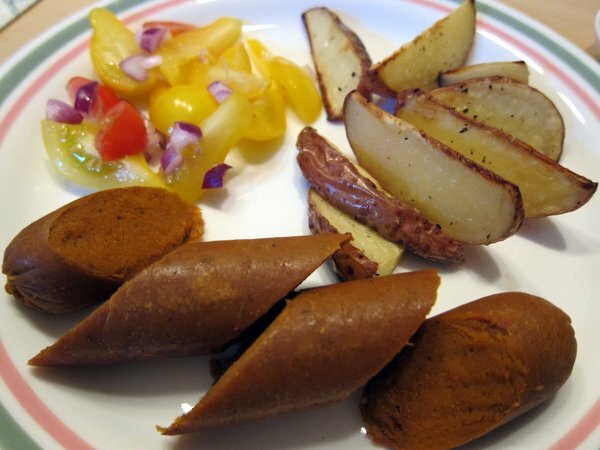 I have been really hesitant to try vegan hot dogs. I’m sure part of it is the annoyance that my mother displayed whenever she had to analyze them. Other than that, I guess I’ve been worried that they won’t taste like the real thing. 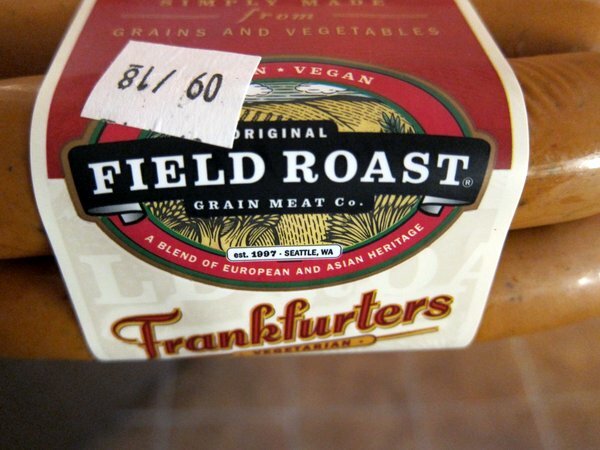 I decided to take a chance when I saw Field Roast frankfurters at the store. I’ll admit that I was attracted to Field Roast based solely on the packaging. The hot dogs are individually cased so you get a link of sausages; none of this smushing 8 or 10 links into one space. They also have a variety of interesting flavors like Mexican Chipotle and Smoked Apple Sage. 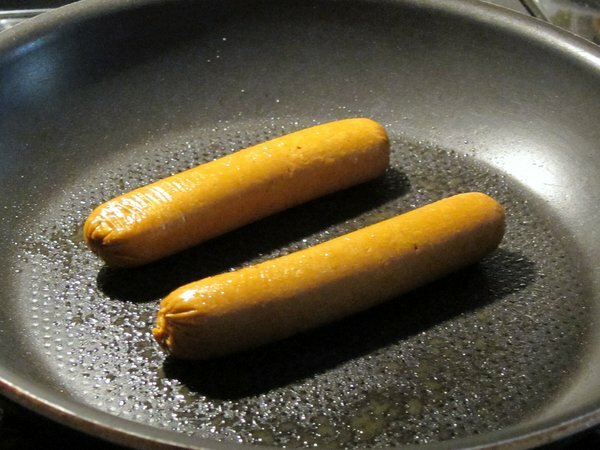 The Frankfurter style look like hot dogs, they smell like hot dogs, they’re easy to cook, and they taste like hot dogs… mostly. They’re spiced really well with a good smoky flavor but a bit too salty for my taste. I wouldn’t say that they taste vegan so much as that they taste like a fancier brand of hot dog (a classy hot dog, if there is such a thing). They have a very solid texture, not chewy or grainy or crumbly.They go really well with ketchup. I tried them with mustard as well, but I found that the saltiness didn’t mix well with the mustard.They are not gluten-free, but they are soy-free. You can prepare the sausages by boiling or grilling or browning: I opted to brown them since the instructions for boiling called for them to remain in their casing and I wasn’t comfortable boiling the product in its plasticky casing. Hey, check these guys out! 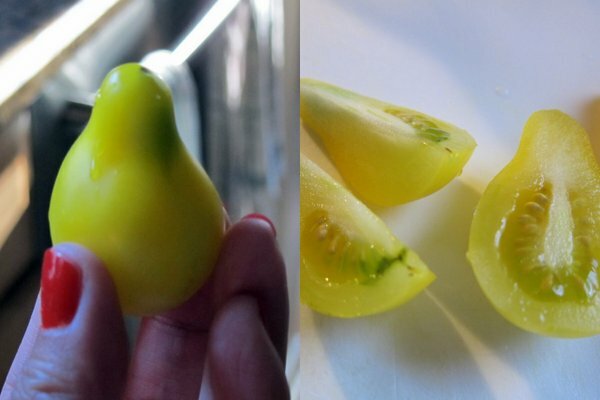 I cut up a handful of these tomatoes from the garden and mixed them with some onion to go with my hot dogs. The verdict: these frankfurters are good. Not quite wicked good, but good. They’re definitely a great substitute if you find yourself craving a hot dog. I do want to try the other products that Field Roast has to offer, but I came to a conclusion after this meal: I don’t miss hot dogs!